During the US presidential campaign, Donald Trump made the elimination of American trade deficits with NAFTA countries a major promise. 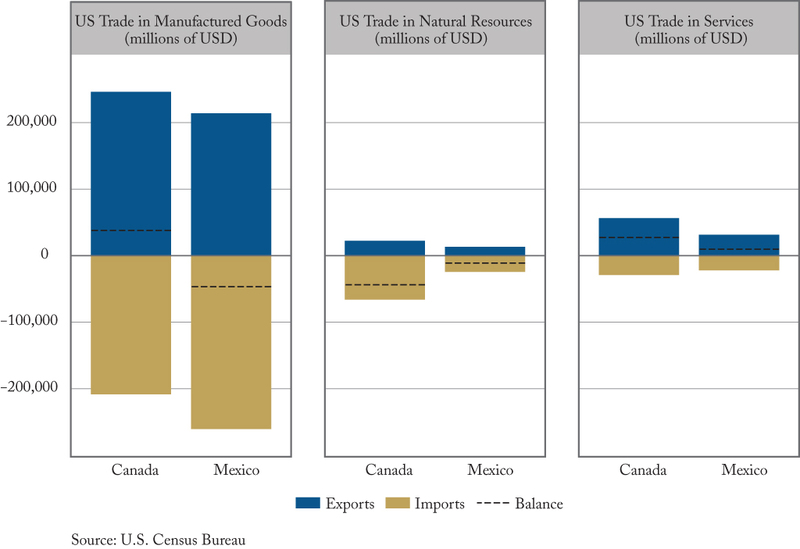 But as this edition of Graphic Intelligence shows, it would be a mistake to equate US trade with Mexico and trade with Canada, as the two could not be more different. While the US trade deficit with Mexico is driven by an inflow of manufactured goods, the US, in fact, has a trade surplus with Canada in this category. Meanwhile, there is also a much larger volume of trade in services between Canada and the United States, with another strong surplus in favour of the latter. Almost all the trade deficit with Canada is driven by the import of Canadian oil and natural gas. This begs the question, will the new US administration treat Canada and Mexico as one and the same? To read more about President Trump and NATFA, read "The Art of Breaking the Deal: What President Trump Can and Can’t Do About NAFTA," by Jon Johsnson.